It’s the time of year for many of us for graduation – graduation from finishing one grade in school and moving to the next. Graduation is also an integral part of our work in Tabitha. This month and the next – all of our projects talk about which families should graduate and which families should continue. It’s not an easy process as many of our families are loathe to leave our programs. I would like to share just one story of a family graduating. Sokeang and her husband and 6 children joined our program five years ago. Life was very difficult but Sokeang quickly joined our savings program – much to the disgust of her husband. She took his abuse for the 10 weeks it took to get through the first cycle and then bought her first sack of rice. His attitude changed dramatically. Over the next few years, they received a well – they raised pigs, chickens and ducks – they grew rice year round – they built a latrine and saved to buy materials for a new home. It took time and courage and strength but they continued. I asked them how it all felt. Her husband looked at me – you gave us water – cool, clean abundant water and we could do everything – you gave us a way to protect our money – to do things step by step – now look at us – we are happy – we work hard but we are happy. We cannot say thank you enough. Graduation is a good thing! We have families who don’t have enough land to grow rice year round – for them the challenges are harder. As staff we talked about families who don’t have enough land – what else can they do. We talked about raising various different kinds of animals such as field rats. 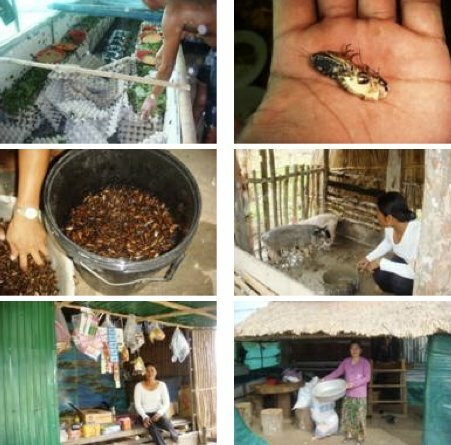 One of our families is in the middle of his changes – Vutha decided to raise crickets – considered a delicacy for Cambodians. Vutha and his wife have 5 children and the pressures of life are great – it was hard to start such a business but it’s become a life changing one. Since they started raising crickets a year ago, they have been able to buy and raise pigs, start a small shop and buy rice security. What is even better is that this family is helping several other families to begin a cricket business as well. In a few years time, they too will be ready to graduate. How good is that! My daughter Miriam graduates from grade seven next week and both of us are celebrating already. We will leave next week to go to Canada – to renew our ties with family and friends, to thank those in Tabitha Canada who are so faithful. It’s been three years and so much has happened during those years – so much to share and to be thankful for. I thank my God for the great privilege of the life I have – to be with so many who change from despair to living a good life. I thank my God for all the graduations, for all those who are beginning to dream and for all those who are in the process of moving towards graduation. I thank my God for each of you – you who allow so very many to dare to dream again – to dare to change and who dare to graduate. How good is that! Talk with you again in August when we return to start a new year of school and a new process of moving towards graduation.